We also tend to associate pain (physical or emotional) with suffering, which can certainly be the case (especially with acute pain—the kind that’s sudden and has a definable cause—not the kind that makes your significant other coo “Aw, what ‘a cute’ pain!” I know…more work on the jokes, Debra). However, read this slowly to let it “sink in”, because there is a distinction: to suffer involves emotional and thought processes in reference to our painful experiences. The degree of suffering we feel is not always equal to the perceived level of pain we feel. In other words, one may “suffer” from minor pains, where another person may view severe pain as a temporary, minor inconvenience, with very little suffering involved. In 1999, 5 days before my wedding, I was diagnosed with spinal meningitis (thankfully, due to the medical knowledge I had by that point, I recognized the signs and was able to get to the ER for a spinal tap to confirm). To make a VERY lengthy story short, that day one of the symptoms I had was what they call a “spinal headache” (resulting from a lack of cerebrospinal fluid surrounding the brain, which can occur for any number of reasons). It has NEVER gone away. I live with daily chronic pain, which was devastating and debilitating for the first 14 months. Now I have learned to manage it, which takes a LOT of time, patience, and dedication to practice the techniques that keep the pain at a “baseline level” (but it is never completely gone). Most people are shocked to learn this about me, as I was “trained” to hide my pain behaviors that would make others aware of my pain. The Yoga Sutras teach us that suffering is part of our existence…every single one of us! So we should expect to feel pain (physical and emotional) periodically (not that we close ourselves off from the world in fear of it, mind you!). Pain is natural, and cannot be avoided. However, here’s the deal: the extent to which we suffer as a result of the pain is completely within our own control. Do we attach to the pain, or can we, as Jon Kabat-Zinn (one of the pioneers of mindfulness) teaches, merely drop in on it occasionally, much as we would drop in to hang out with a friend? 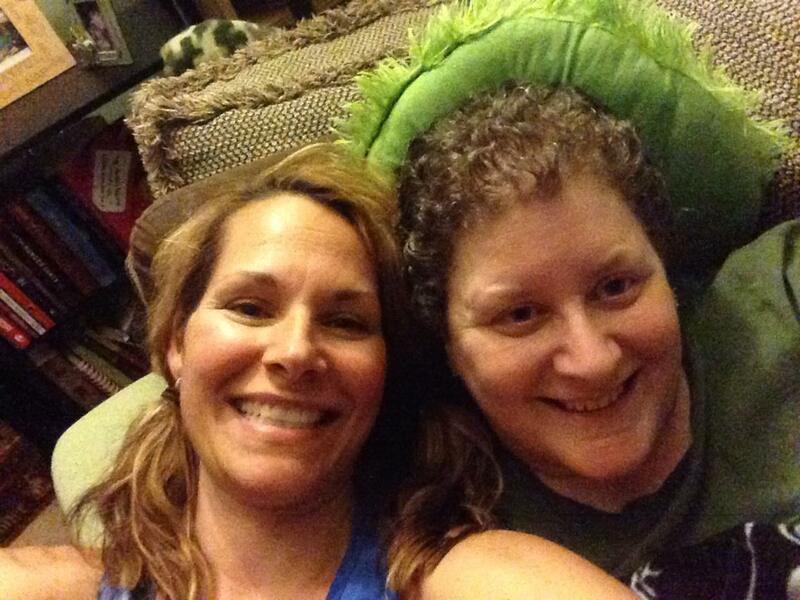 Dropping in to hang out with Sherri…despite my chronic pain! Kabat-Zinn suggests that we view pain as an opportunity for mindfulness…that the “explosion of sensations” occurs within a brief moment. Within that span of time, we can remain aware of the ebb and flow of sensations. For example, physical feelings may shift from burning and stinging to a duller throbbing, and anger may shift to sadness. Thus, we create a frame of reference from which the experience of pain unfolds. In essence, we are observing the pain as a witness—detached yet observant and aware. What is important is the understanding that “I am not my pain”. This attitude helps to create feelings of control, from which the pain is more effectively managed. A simple technique that I have found to increase mindfulness and accept whatever pain is present is by doing a mind/body scan: simply be comfortably seated or lie down, and slowly bring awareness to each part of your entire body, with the mindset of “I am not my pain”. Whatever pain may arise (physical OR emotional), view it as a teacher… what is it trying to tell you? How can you get to know it, understand it, and learn from it? Rather than repress the pain (or beginning to think negative thoughts), observe the pain without judgment, with an attitude of acceptance, and breathe with it in the moment that it is present…and the next, and the next, as long as it remains. As with anything worthwhile, this practice takes time and patience. In terms of pain, mindfulness WILL have benefit…the pain won’t go away, or even necessarily be diminished, but it can serve to teach wonderful things about yourself! ====> Do you suffer from chronic pain? Do you rely on prescription and/or non-prescription drugs to “get through the day”? Have others expressed concern about your behaviors? Do you obsess about the pain, and/or avoid certain social events or everyday tasks for fear that it will increase? Pain management is one of my specialties, and I love to help people learn simple techniques to help manage pain. and once again enjoy the things you used to love? Let’s chat about how I can help you find your “true self” again! CLICK HERE to learn more, and scroll to the bottom of the page to schedule a time for us to talk. I promise you won’t regret it! Pain does not mean you can’t smile anymore.